A crude media cover-up for socialism is to ignore the socialist atrocities of the Union of Soviet Socialist Republics and of the People's Republic of China, and to cover-up the socialist atrocities of the National Socialist German Workers' Party by referring to the group by using the hackneyed and deceitful abbreviation. The media refers often to the atrocities of the horrid National Socialist German Workers' Party but rarely identifies the group as socialists nor even by its actual name. Every media comment about the horrid National Socialist German Workers' Party could be repeated and compared in a clone image (or worse in numbers killed) with the Union of Soviet Socialist Republics and Communist China. The media rarely do similar stories about the socialist atrocities of the Union of Soviet Socialist Republics and the People's Republic of China, etc. 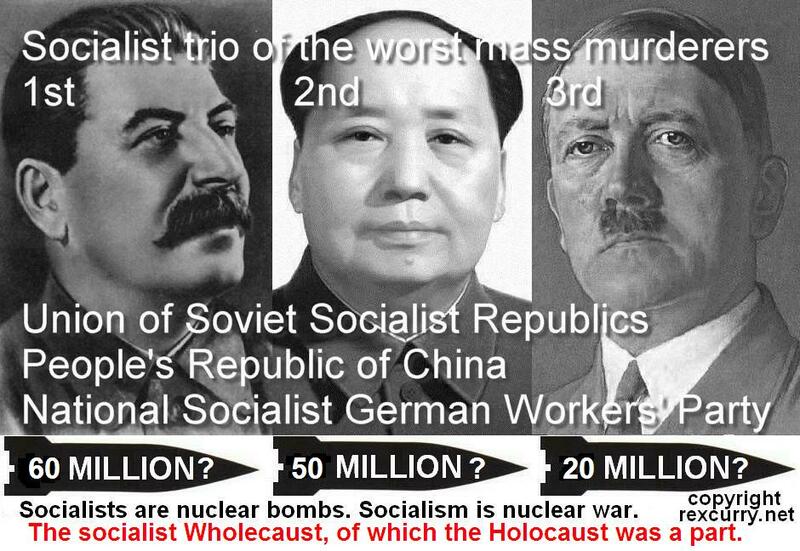 The Union of Soviet Socialist Republics and the People's Republic of China both independently slaughtered more people than did the horrid National Socialist German Workers' Party. The socialist Wholecaust occurred under the industrial armies of the socialist trio of atrocities (see http://rexcurry.net/socialists.jpg): the Union of Soviet Socialist Republics, 62 million deaths, 1917-'87; the People's Republic of China, 35 million, 1949-'87; and the National Socialist German Workers’ Party, 21 million, 1933-'45 (numbers from Professor R. J. Rummel's article in the Encyclopedia of Genocide (1999)). Sometimes "I told you so" just doesn't seem to cut it. Socialists are nuclear bombs. Socialism is nuclear war. It is odd that the media devote so much material to the monsters who came in third place in world genocide and that they do it so inaccurately.